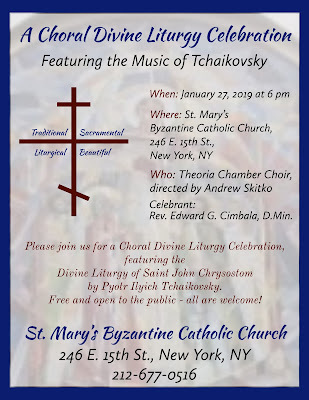 St Mary’s Byzantine Catholic Church in New York City will have a celebration of the Divine Liturgy of St John Chrysostom with the musical settings of the choral parts by Pyotr Ilyich Tchaikovsky, on Sunday, January 27, at 6:00 p.m. 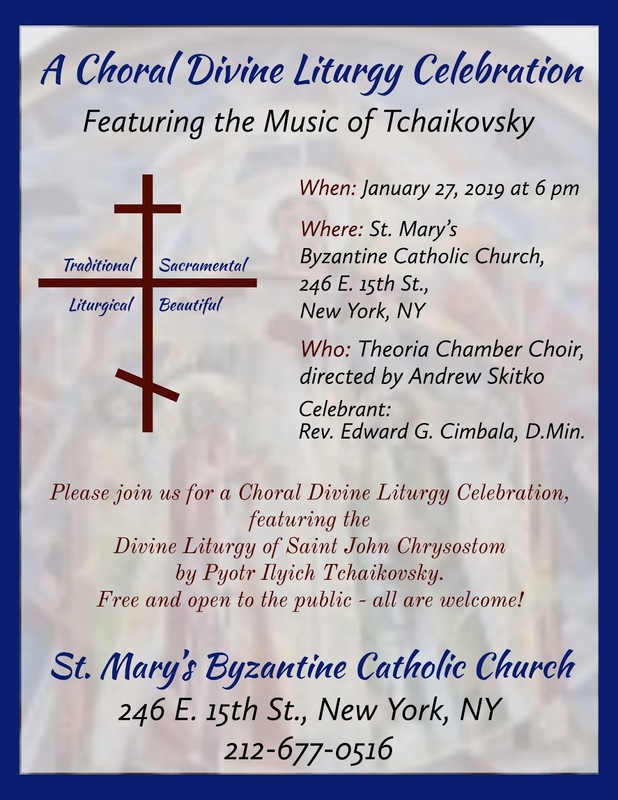 The Liturgy will be sung in English and Church Slavonic; the church is located at 246 East 15th Street; the event is free and is open to the public. Tchaikovsky’s setting constitutes the first “unified musical cycle” of the liturgy. This is the first in a program events to be presented at St Mary’s through the year, in which the liturgical music of the great Slavic composers will be presented within the context for which it was composed, as the music of the Divine Liturgy, giving the congregation the opportunity to be immersed in the experience as part of their worship. The music will be performed by St Mary’s choir-in-residence, the Theoria Chamber Choir, directed by Andrew Skitko, Artistic Director/Conductor. Mr Skitko earned his bachelor’s and master’s degrees in Music at Westminster Choir College, and has performed with the world’s leading conductors and orchestras at venues such as Carnegie Hall and Lincoln Center. He sings regularly with several choirs, and is a cantor for the Byzantine-Ruthenian Church; he is also an alumnus of the Studium Carpatho-Ruthenorum of the University of Presov, Slovakia, having completed courses in Carpatho-Rusyn history, language, and culture. He has studied Russian choral music and conducting at St. Vladimir’s Orthodox Seminary with maestro Vladimir Gorbik, musical director and conductor at the Moscow Representation Church of the Holy Trinity-St. Sergius Monastery, and has participated in the PaTRAM Russian-American Music Institute. Fr. Edward G. Cimbala, D.Min, pastor of St. Mary’s will be the celebrant and homilist. The backdrop for the choral event is sure to just as inspiring. St Mary’s Byzantine Catholic Church is one of the most unusual religious buildings in Manhattan and provides a beautiful venue for the program of Slavic Liturgical Music. For more information call 212-677-0516.